A perfect entree to Mother India, we’ll begin our journey on the sublime beaches of Goa. We’ll be the exclusive guests at a luxury 5-star resort named by Conde Nast as one of the world’s top 25 beach retreats. With stunning sunset views and footsteps to the Arabian Sea, you’ll experience tastefully decorated rooms, fresh & organic cuisine and lush gardens. You’ll enjoy deep yoga practices twice a day designed to nurture your inner relationship to yoga. You can take some time out to unwind on the beach, have your driver run you into town for sightseeing, or relax with a massage or spa treatment. Click here to view photos from past retreats. Our week together will leave you truly transformed, visibly glowing and ready for your return journey home or to continue with us to witness the yoga culture of the north! 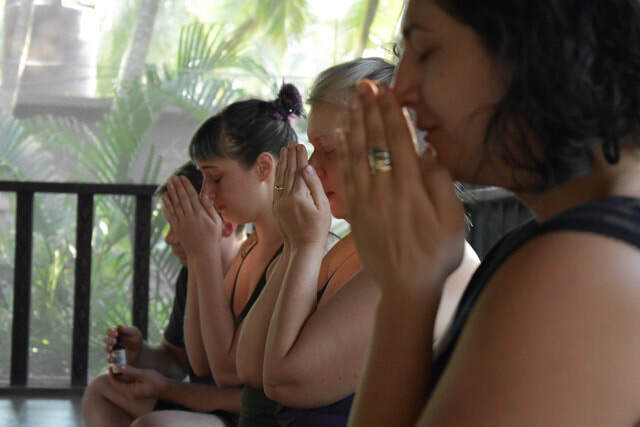 This retreat is open to all levels of yogis who are wanting to deepen their yoga journey by traveling to the Mother India – or – for those who have the urge to explore a world entirely different from our own. All meals – custom planned by our private chef with organic, fresh & local cuisine. 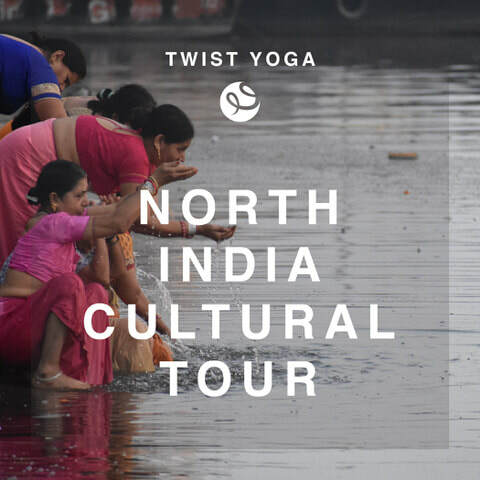 Tried and true itinerary; this is Twist Yoga’s fourth retreat to India. We’ve rented out the entire Coco Shambhala boutique hotel property. Our accommodations are a blend of architecture, design and attention-to-detail service to soothe your senses. Villas sit in complete harmony with the local tropical landscape to provide the discerning traveller a sense of nurturing, balanced relaxation. Everything speaks of private, quiet luxury: From the free form jungle style swimming pool to the carefully curated vintage furniture, the culinary experience designed by one of India’s leading chefs and food stylists, to the most exquisite Indian textile linens, the books dotting the villas to a 24 hour concierge and your private driver—this #1 rated property on Trip Advisor overlooks nothing. Guest list limited to 16. Register early, this retreat is always a sell-out. Take a sacred journey to the mountain town of Rishikesh, situated in the Himalayan foothills. We will immerse ourselves into the culture of meditation, prayer, & practice by visiting auspicious sites, hiking the Himalayan foothills & honoring the sacred Ganges River, both in personal ritual and ceremony. Our expertly crafted cultural visit to North India is centered in Rishikesh, the self proclaimed “Yoga Capital of the World” and made famous by a visit from the Beatles in the 60s. Rishikesh has been a magnet to spiritual seekers for decades; to visit brings a deep, lasting sense of spirituality and inspiration. We’ll stay at Atali Ganga, a luxury eco-retreat overlooking the stunning Ganges River. You’ll sleep in the quiet of the moutains: We will wake slowly, and start each day with pranayama, meditation & asana practice. 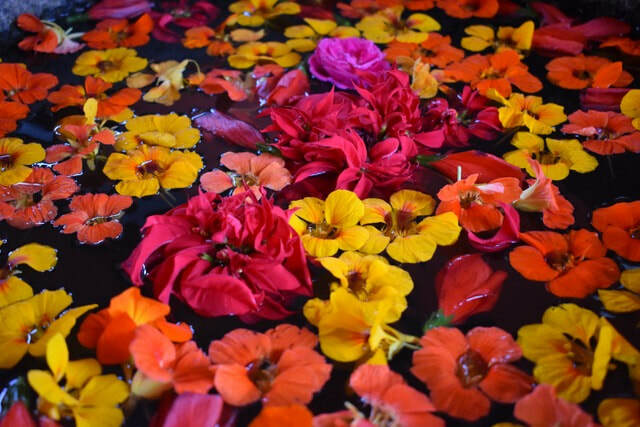 Visits to sacred temples & historic meditation caves are on the schedule, as are guided hikes (mild and challenge option) to Himalayan villages, cleansing dunks in the clean waters of the Ganges, and a private fire puja with a local priest at sunset on the banks of the Ganga. Additional options available to white water the Ganges, visit the Maraharashi ashram made famous by the Beatles, and witness a sacred, bustling Aarti ceremony in town. You’ll also have ample time to honor your own interests, head into town for terrific shopping, or simply rest. It’s impossible to travel to Northern India without being touched permanently. 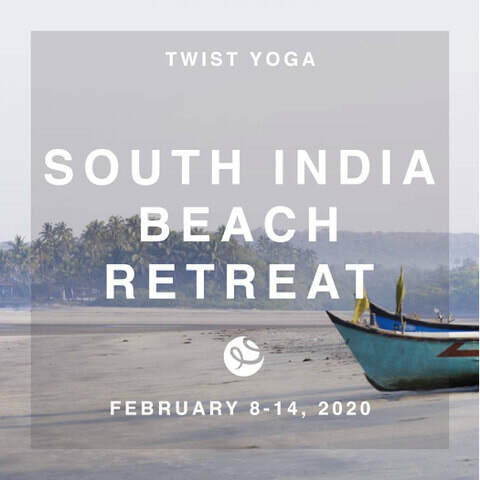 You’ll travel with confidence, trusting this retreat is expertly curated – it is Twist Yoga’s 4th retreat to Rishikesh and Jen’s seventh visit to India; all locales and guides have been thorougly vetted to provide a smooth and unforgettable travel experience. We are honored to share our knowledge of India with you. Click here to view past retreat images. For travelers wishing to add on a Taj Mahal visit -or- a visit to Varanasi, ask Jen for a free curated itinerary. 6 nights shared (double or triple, with private bath) accommodation in 4.5 star eco-hotels. Shared: $1895 if registered prior to Oct 1. Add $300 after. Single: $2395 if registered prior to Oct 1. Add $300 after.